On the morning of October 15, 2014, security police on the eastern Aegean island of Kos were alerted to the presence of a man taking photographs of the Portes military guard post from his car. Officers responded immediately and the suspect, a 69-year-old German national, was intercepted a short time later on a rural road near the village of Pyli. A search of his vehicle turned up a pair of binoculars, a telescope, a camera and three memory cards. After a search of his house in the town of Kos, the suspect was arrested and charged with espionage. Two years later, he was found guilty by a mixed jury court on Rhodes and sentenced to 14 years in prison, which he has since been serving on the southeastern Aegean island. 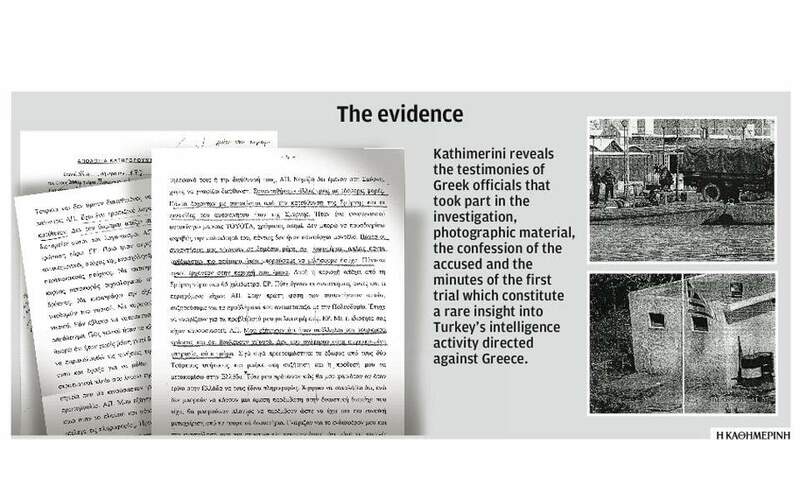 Ahead of the start of his appeal this week, Kathimerini brings to light the testimonies of the Greek officers who were involved in the investigation, the suspect’s interrogation and subsequent confession, and the minutes from the first trial – a rare collection of evidence of efforts by Turkey’s National Intelligence Organization (MIT) to spy on Greece. The Turks paid the 69-year-old 3,000 euros a month, including 1,000 euros for travel and other expenses (like cameras, SIM cards etc). The money was deposited in an account he kept in Germany. He said the Turkish agents were interested in troop movements, the island’s infrastructure and the movements of ships working with the European border agency Frontex that patrol the waters between Greece and Turkey looking for vessels carrying illegal migrants. The agents provided him with a laptop and a USB that looked like a regular storage device but was equipped with special coding software so that he could send them the information he gathered. After confessing, the 69-year-old German worked with Greek investigative authorities and provided details and explanations to officers of the country’s National Intelligence Service (EYP) who visited him several times in prison. The 69-year-old’s lawyer, Achilleas Daskalakis, told Kathimerini that the defendant sent only a limited number of photographs to the MIT agents and that their content was not classified as it pertained to installations that were in plain sight. He also stressed that his client had no intention of harming Greece’s interests and genuinely regrets his actions. “He cooperated with the Greek authorities and answered all the Greek officers’ questions,” said Daskalakis. Another German retiree was arrested on charges of spying on Greece for MIT on the island of Chios in August 2013. “When another pensioner was arrested in Greece, [MIT] informed me that I was on leave and shouldn’t do anything,” the 69-year-old said in his confession.